UFC President Dana White joins the show and talks to Jim and Matt about a wide variety of topics including the recently announced Khabib vs. Conor McGregor fight, Nate Diaz's Octagon return, Stipe Miocic feeling disrespected by DC vs. Brock Lesnar, Eddie Alvarez's contract situation, the possibility of Ben Askren joining the UFC, Colby Covington's trip to the White House, and much more. First, TJ Dillashaw calls in and discusses the first defense of his second UFC Bantamweight title reign over Cody Garbrandt at UFC 227, working his boxing in preparation for the rematch, who he'd like to fight next, and more. 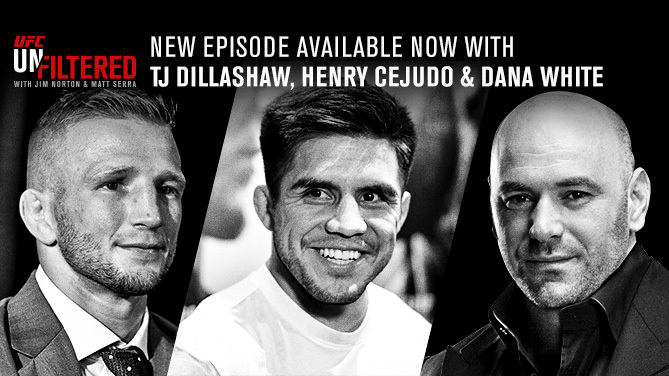 Then, Henry Cejudo talks to the guys about his big upset of Demetrious Johnson to capture the UFC Flyweight title, how he established his karate style over the last couple of years, wanting to challenge TJ Dillashaw for the UFC Bantamweight title, and a lot more. Plus, the guys discuss a slew of recently announced fights and break down all the action from Los Angeles at UFC 227. Henry feels he can KO TJ Dillashaw fighting at 125lbs.